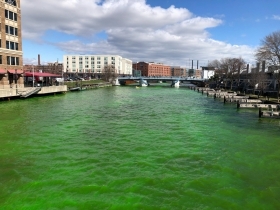 The Milwaukee River Turned Green for the Bucks. Photo by Jeramey Jannene. 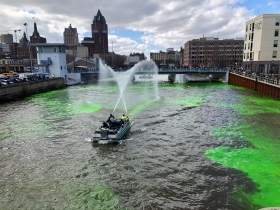 The Milwaukee Bucks have turned the Milwaukee River green in advance of the NBA playoffs starting this weekend. 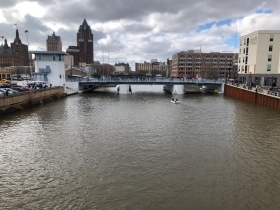 Feigin, the team’s president, said coloring the river is one of many exciting ideas the organization has to build interest as it heads into the playoffs. 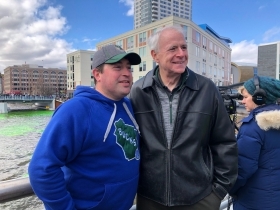 “Judging by the turnout, I think we were right,” said Feigin of the couple hundred people, many wearing Bucks gear, that lined Downtown’s bridges. People seemed pleased with the result. “It looks good. 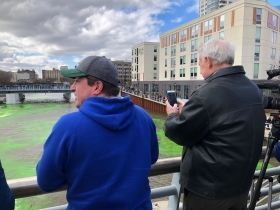 I thought it was going to look like the river that is green already,” said a woman who walked up to this reporter and offered her opinion unsolicited. 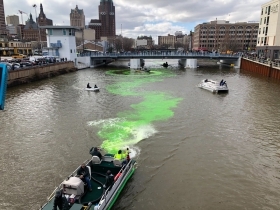 The dye, which Feigin described as “organic, like a vegetable paste,” was first placed in the river near the W. McKinley Ave. bridge. It then followed the current, heading towards W. Wisconsin Ave., the Historic Third Ward and Lake Michigan. Barrett said it was the first time someone has sought to color the river since he was elected in 2004. 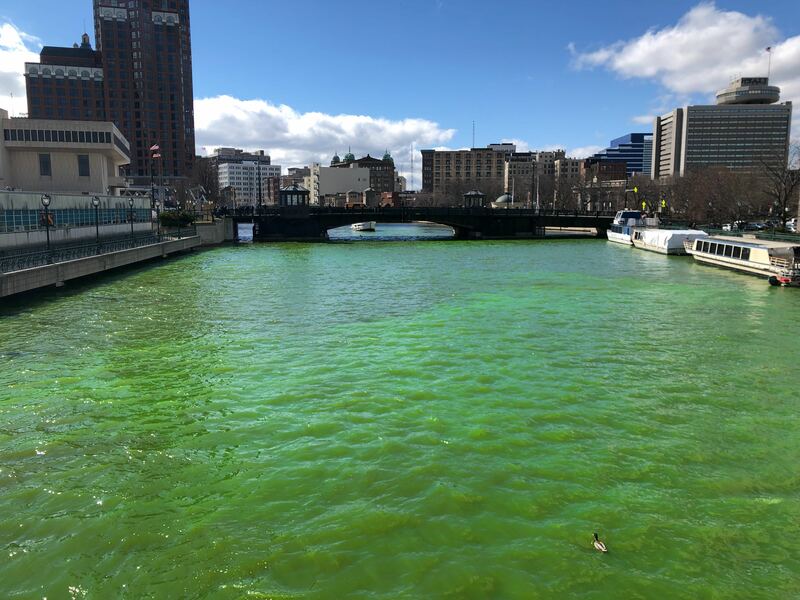 However, 90 miles south, the city of Chicago turns its river a similar shade of green every St. Patrick’s Day. The team, which finished the season in first place in the NBA, hopes to win the league championship this year. “Winning really is the end game,” said Feigin. But Feigin also believes the team’s success on the court can help its business off the court. The team is seeking to develop nearly 30 acres of land surrounding Fiserv Forum in addition to growing its brand internationally. How does winning help? “It’s a multiplier. It’s a complete acceleration,” said Feigin. For more on what the team has planned, including a branded streetcar, office tower turned billboard and new version of a classic song, see our story from earlier this week. The Milwaukee Bucks’ first-round series against the Detroit Pistons starts on Sunday at 6 p.m.